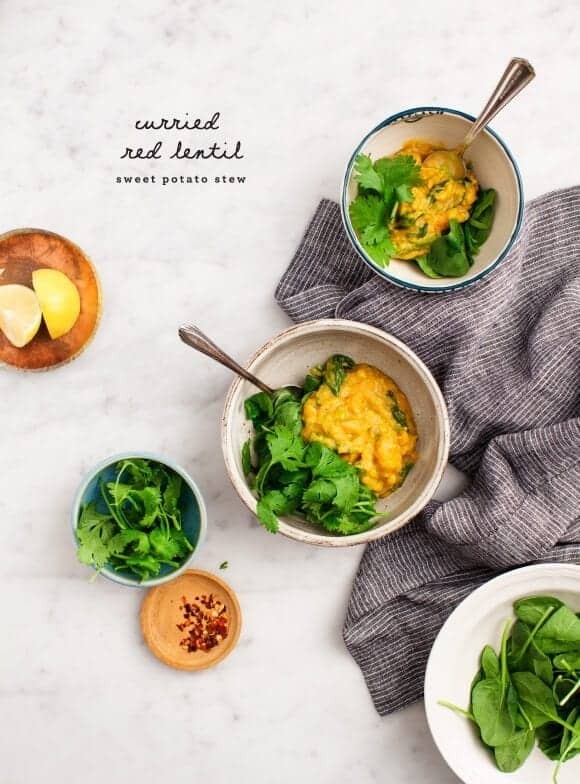 An easy weeknight curry recipe made with red lentils, sweet potatoes, green beans, peas, and spinach. Vegan, gluten-free, healthy, and delicious. 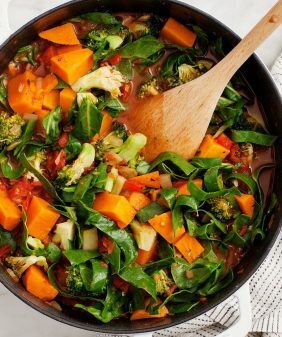 If you’re like me and are ready to be converted, this red lentil sweet potato stew is a darn good place to start. Though it’s a bit of a hot mess, it’s been one of our favorite recipes this fall. Unlike most soups that I make, it’s not broth-y or creamy. Instead it has a deliciously thick texture that’s somewhere in between. It’s spiced with ginger, curry & cardamom and brightened with generous squeezes of lime. It’s great the first day, the second day, and… well… it didn’t last any longer than that in our house, but it won’t be long before I make this one again. Heat the oil in a large pot over medium heat. Add the onion and a few pinches of salt and pepper and cook until soft, about 5 minutes. Add the carrots, garlic, ginger, and sweet potatoes and stir. Add the curry, cardamom, and another pinch of salt and pepper. Stir again and cook until the spices are fragrant, about 1 minute. Add the lentils and broth. Reduce heat and simmer until the carrots and sweet potatoes are soft, 20 to 30 minutes. Use an immersion blender (or a potato masher) to coarsely blend the stew. Add the green beans, peas, and spinach and cook for another few minutes. Add the lime juice, lemon juice, and red pepper flakes, if using. Taste and adjust seasonings, adding more spice, lime, and salt and pepper to balance the flavors to your liking. Garnish with fresh cilantro, if using, and serve with lime wedges. If desired, combine all yogurt sauce ingredients and serve on the side. *muchi curry powder is a blend of turmeric, cumin, ginger, black pepper, coriander, fenugreek, garlic, cloves, cayenne pepper and caraway. (I have the whole foods brand). Substitute any curry spice you like, if you're sensitive to spice, start with less and add more to taste. If you over-spice your soup, add a splash of white wine vinegar to tone down the heat. 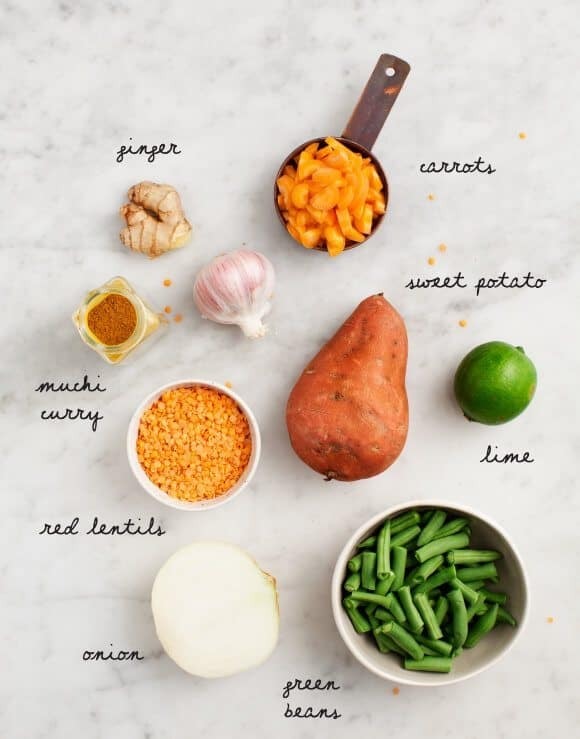 Wow, I didn’t realize you don’t have lentil recipes here before this one – buy hey, really great one for your first 🙂 I love lentils for starters and I’m a big fan of curry as well, so I’m really excited about this Curried Red Lentil Sweet Potato Stew recipe. Lentil love will creep up on you slowly, until one day you wonder what you ever did before lentils. 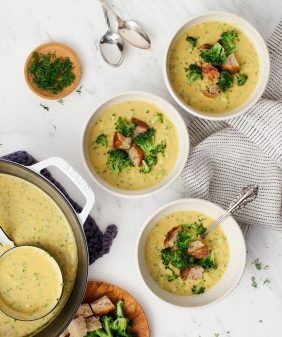 This lentil soup looks beautiful. I just made this, AWESOME!! !🖒🖒🖒FIVE STARS!!!! thanks Rachel! SO glad you loved it! I’m all about warm, hearty stews this season, and you had me at red lentils and sweet potato (I just made a chili with those ingredients too!). This just looks so comforting! Haha, I guess I’ve always been so excited about whatever recipe you put out I didn’t even notice you never use lentils! I don’t need to be convinced when it comes to lentils, and especially this soup. 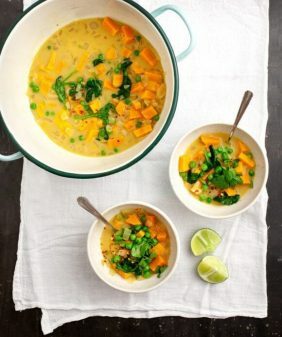 😉 I love the coconut, red lentil, sweet potato combo, perfect winter comfort food. And I like that you use cardamom in here too. may I ask what kind of pots you are using? They look beautiful! Welcome to the lentil fan club Jeanne! Or “kind of” ;). This red lentil stew looks so hearty, warming, and full of flavor – everything I am craving this time of year <3 so lovely. This stew looks and sounds soooo comforting! I wanna make it and bundle up on the couch with my dog! I love lentil soup. However, I’ve never had the pleasure of trying red lentils. I’m excited to test out this recipe and share it with my mom. She’ll enjoy this a lot. Aww, you’re so sweet – I’m so glad you loved it as much as we did! This looks fantastic, and very warming for this time of year. Thanks for the tip with the vinegar. I am prone to adding too much heat and then just suffering through it. WOW! Just made this on a damp, November London evening. Absolutely delicious and really easy to make. My mouth was watering as it was simmering as it smelled so delicious. I used watercress instead of spinach and extra peas as I didn’t have any green beans. This dish is amazing! Thank you for sharing this recipe. I’ve made it twice now, it’s so delicious! Everything I’ve made from this blog has been a hit. What to do when your city closes down for a rare winter storm? 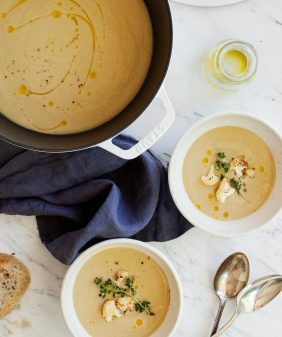 Why, check Love and Lemons for soup ideas of course ! It was a safe alternative to the drunk sledding that broke out in the neighborhood. 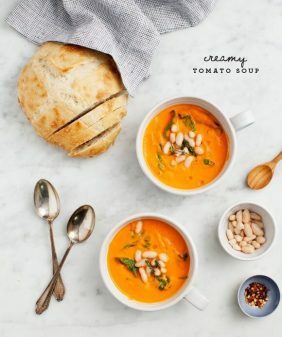 Was looking to make the Tomato Chickpea Coconut Soup (for the third time) when I saw this gem. It’s so good! I took some liberties-added a shallot, a whole bag of red lentils, a can of coconut milk and a pinch of smoked paprika. Thanks for being such a great part of our snow day in Nashville. HA – best comment ever – you win. Although drunk sledding sounds fun too :). Wow, Jeanine , this recipe was amazing! 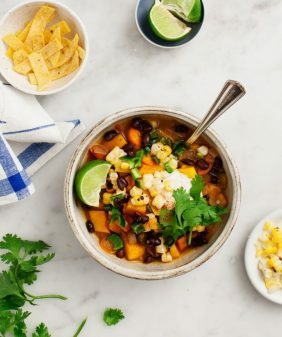 I especially like the Indian influences in the stew- cooking gourmet, vegetarian meals at home usually takes a significant amount of cooking and prep time but this stew recipe made it seem like a breeze! This looks amazing and I actually have (almost) all of the ingredients in the house! I think I’ll try it tonight. Thank you for providing inspiration for tonight’s dinner! I didn’t have muchi curry powder, but subbed another curry powder and added some garam masala with great results. Hi Ashley, so glad you liked it! Excellent! Just made it using garam masala and subbing one cup of the broth for coconut milk (and omitting green beans/peas– just didn’t have them on hand). Really delicious. This was truly delicious. I think the lemon/lime juice was key. Gave it some zing. I added a couple tablespoons of brown sugar and more water but altogether, excellent. I’m a little late to the party here, but just made this. For sure, it is absolutely the MOST delicious soup I’ve ever had. Came together so easily. We couldn’t even wait to put it in a bowl, we ate it directly from the pot! The cardamom really makes it in our opinion. (Not a fan of lentils either, never used cardamom before). Mixed it all together and then took 2 tsps of that combo as the recipe specified. Was flavorful and spicy, but not too spicy (disclosure: I love VERY spicy food so maybe my judgement isn’t the best). Thanks Jeanine, I loved this! This is amazing! I’m now on my 2nd large bowl. I made a few changes (didn’t want to venture out). I used Japanese sweet potatoes, sirracha instead of red pepper, added a variety of greens, and topped it with chopped green onions (green and white part). I didn’t make the yoghurt sauce as I an vegan, but might try next time with vegan yoghurt. This will make it into rotation on my menu. Thanks.